Background: Frischer Wind was original name of Eulenspiegel, the GDRâ€™s weekly humor magazine. These caricatures come from a 1953 book of cartoons from that magazine titled Gale Force: A Selection of Recent German Caricatures. The copy I am working from was given to those attending an SED meeting in Kreis Halle. 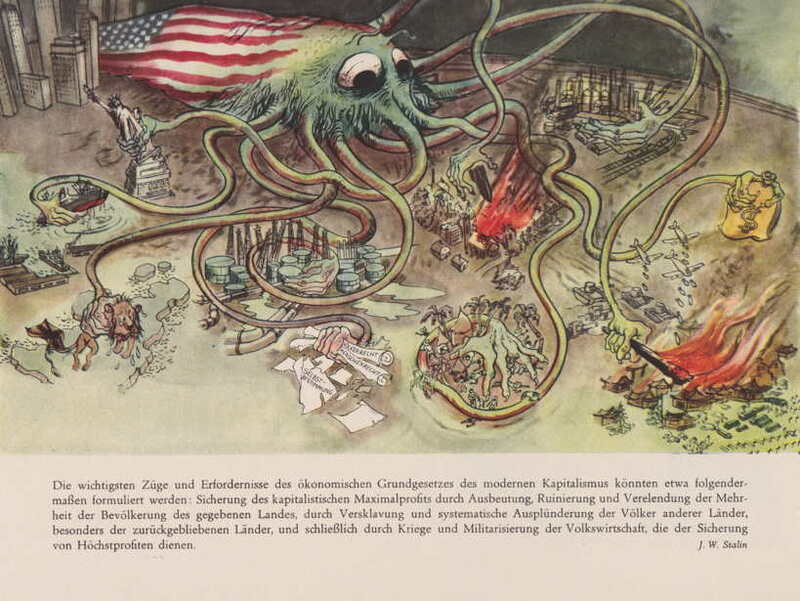 Nearly all of the cartoons focused on the evils of the West. The source: Windstärke 12. 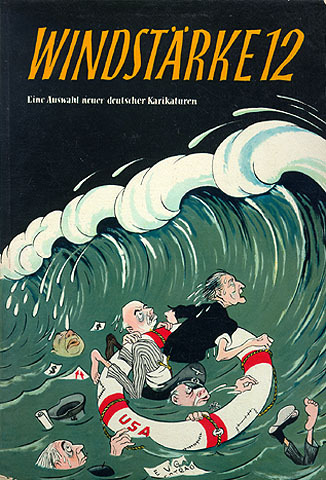 Eine Auswahl neuer deutscher Karikaturen (Dresden: VEB Verlag der Kunst, 1953). 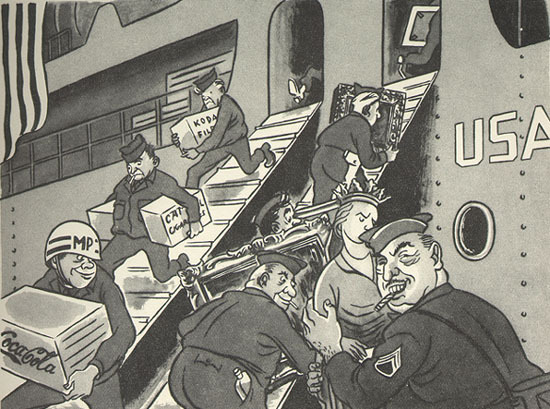 Explanation: American soldiers are bringing in Coca Cola, Kodak film, and cigarettes, and removing Germanyâ€™s art treasures. 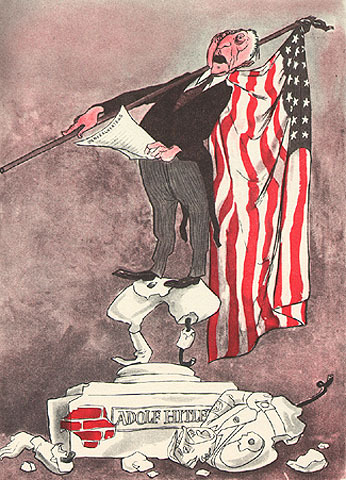 This was part of the general claim that the U.S. was an uncivilized country. 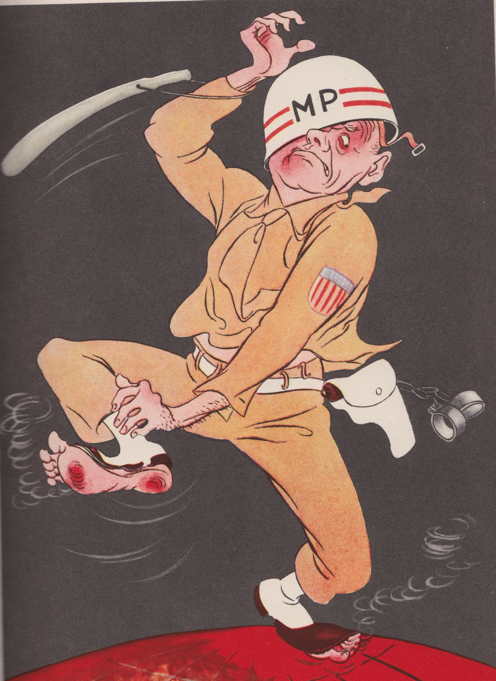 Explanation: An American military policeman gets a hot foot while trying to dominate the world. 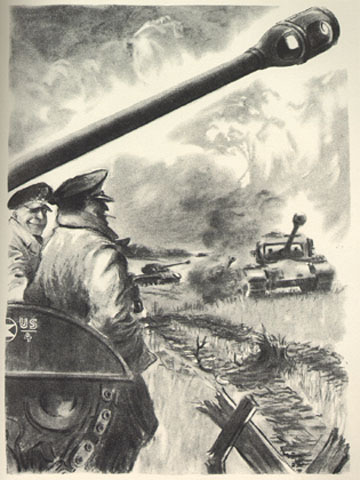 Explanation: American military maneuvers were a frequent cause of friction in West Germany, a fact this cartoon attempts to play on. 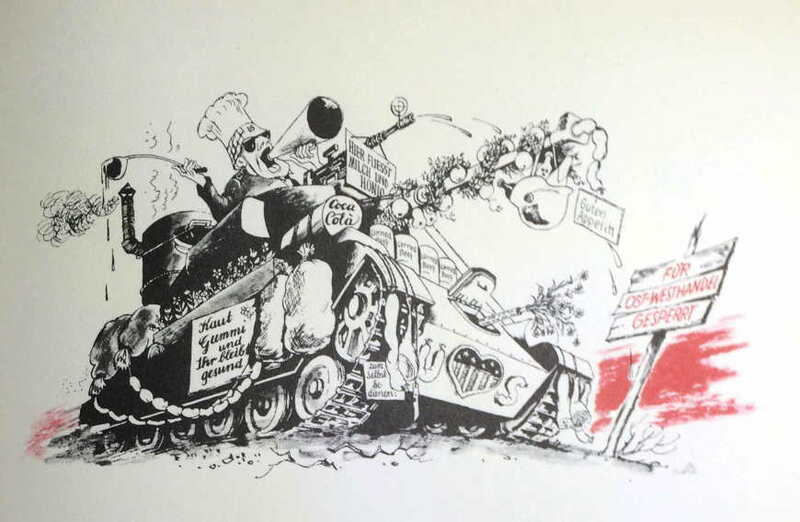 Explanation: An American tank, supposedly the reality of American intentions, is covered by signs saying “Chew gum and stay healthy,” “Milk and honey flow here,” and “Self-service.” There is some Coca-Cola and tins of corned beef. Flowers are nicely placed to conceal the tanks’s guns. The sign says: “Closed to East-West commerce.” The claim is that the United States conceals its aggressive plans by propaganda bout consumer goods. Explanation: Konrad Adenauer, the West German chancellor, is presented as standing in Adolf Hitlerâ€™s place, carrying an American flag and reading a fine speech. Explanation: The paper covering most of the man’s body is titled “Human Rights.” With more of them, the sheet would be longer.... 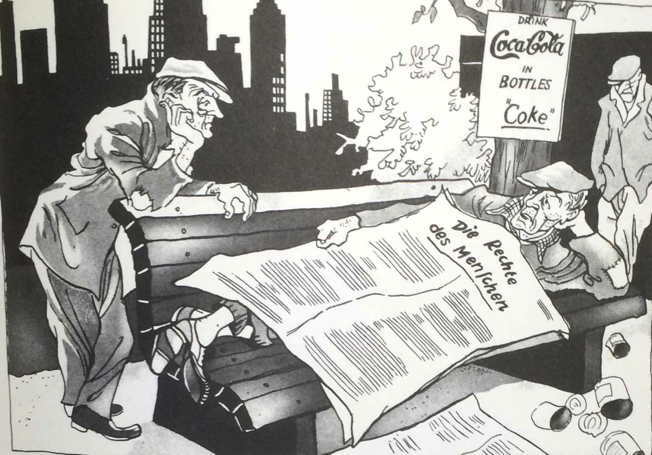 The GDR had a particular antipathy to Coco-Cola, which it made a symbol of the evils of the United States. Explanation: RIAS, short for “Radio in the American Sector,” was an American radio station in West Berlin. It was popular in East Germany. 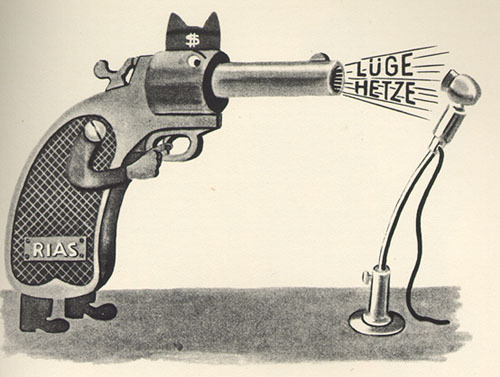 In 1953, the GDR was doing all it could to discourage people from listening to it. The revolver is spouting lies and incitement into the microphone. 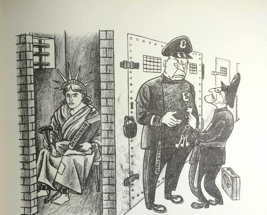 Explanation: The claim is that England is playing second-fiddle to the United States. 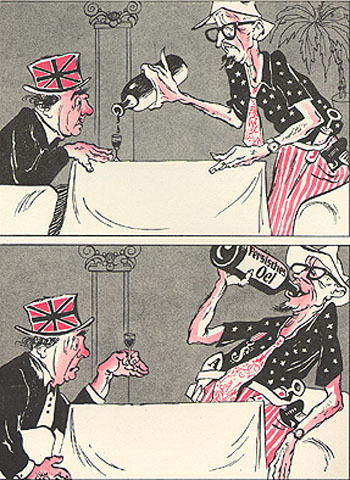 England gets a little oil, the U.S. hogs the rest. 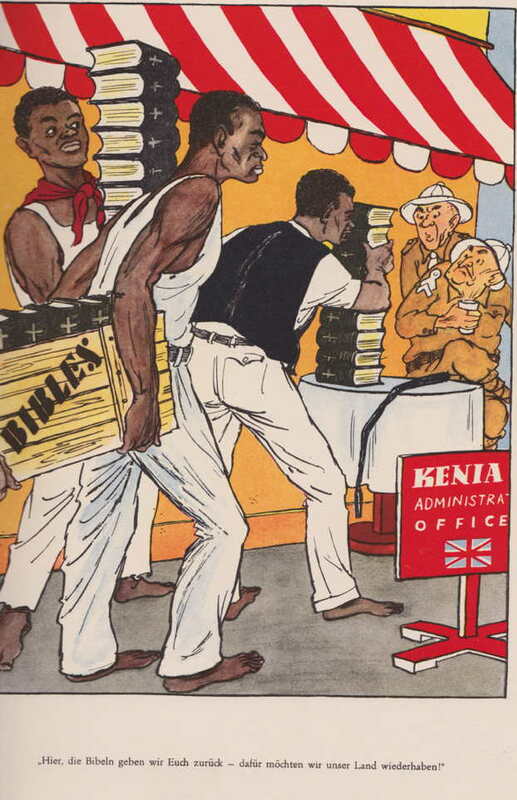 Explanation: The caricature is on the anti-colonial theme, suggesting that the British are using religion to exploit Kenya.